Welcome to Bill's Home Page! Bill has met with U.S. Representative Dan Kildee in Washington D.C and Bay City. Dan supports Realtors and their efforts to provide all buyers and sellers with opportunities to own their home and improve their lives. Bill has been a Notre Dame fan his entire life. It was so nice to meet the legendary Lou Holtz in Florida. Go Irish! Bay County One of the Most Affordable Real Estate Markets in the U.S.! The National Association of Home Builders has rated affordability of real estate markets in the United States for years. At one time in 2011, the Bay County real estate market was the #1 most affordable housing area in the entire U.S. Currently 91.7% of the buyers who earn the average Bay County income of $65,900 can buy a home in the area. Home prices continue to rise in Bay County for the 6th straight year (2013-2018) and with inventory tight, 2019 should see another increase. Bay County Has So Much to Offer! Bay City, Michigan is located in Bay County in the heart of Mid-Michigan in what is known as The Great Lakes Bay Region. Bill Branigan, is one of the top agents in the Bay County Realtor Association, is a Historical Homes Specialist and has helped over 500 buyers and sellers accomplish their goals since the year 2000. His virtual tours of his listings have been viewed over 94,000 times! Bill is the first and only agent in Bay County to have earned the Seniors Real Estate Specialist (SRES) designation. He is also a Graduate of the Realtor Institute (GRI), a Certified Residential Specialist (CRS) and an Accredited Buyer Representative (ABR). Bill was the 2017 President of the Bay County Board of Realtors and was named the Realtor of the Year for 2017. Bill has also been a member of the Bay City Planning and Zoning Commission for the past 5 years contributing his real estate expertise in matters that come before the board. Buying and selling real estate is a process of change. You need to be in the hands of a dedicated, innovative, experienced professional who can successfully market your property and guide you in finding that next place to call home. Click on the headings above and tour this site and then call Bill as so many other satisfied clients have done. Bill is a proud supporter of the Saginaw Basin Land Conservancy. Watch the video below to see the great work that they do! 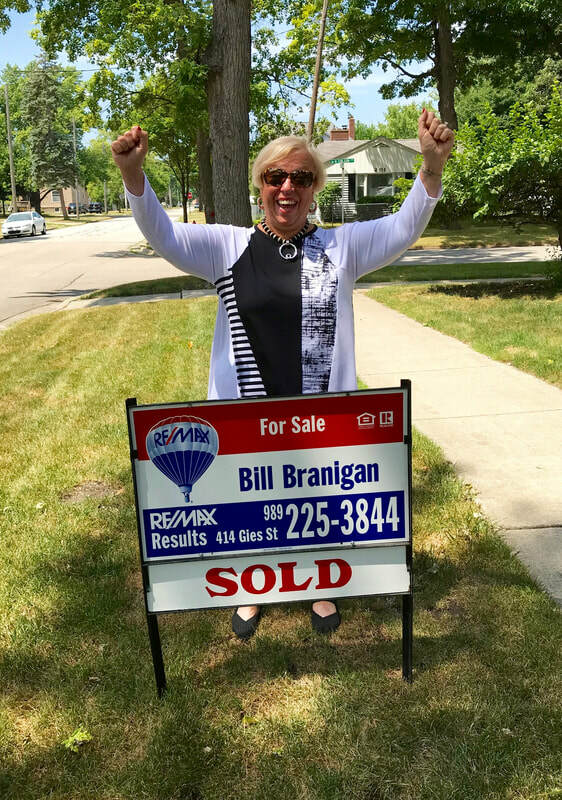 Bill's Sellers and Buyers do get excited about both Selling and Buying. This all-time great photo comes from my client and friends, Judy and Gene Gillette of Bay City. Experience the feeling of joy that comes from achieving your goal and starting that new chapter in your life.